This panel is used to draw segments, ellipses, rectangles, curves... Brush selection and cutting options are also available here. 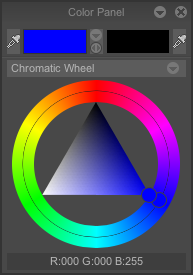 This panel is used to select the color in which you wish to work. Distinction is made between the A color (always referred to as main color) in the left rectangle and the B color in the right rectangle. 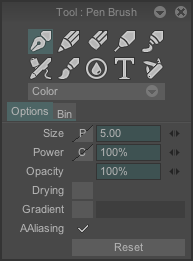 The tool panel contains a wide choice of buttons corresponding to traditional drawing tools : airbrush, brush, pencil, wet brush, etc. Various parameters may be set : size, power, opacity, etc.